Kick up the grill with this Spring Time Burger recipe. Your family and guest will love you for it! This is so tasty! You will need more than one napkin when you eat it! Combine meat, peppers, onions, garlic, oregano, Amazing Taste Seasoning (really makes the burgers juicy) and 3 tablespoons of Rotel tomatoes. Form into desired amount of patties and grill. I use a George Foreman grill and cook the burger 4 min, flip and then 3 minutes. 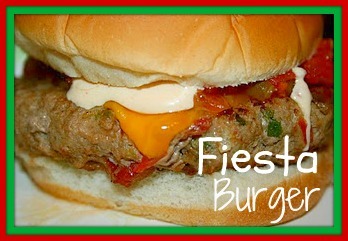 Add cheese to burger then put on bun and top with more Rotel tomatoes and Dressing. You'll need several napkins with this burger! I left the seeds in when I diced up the peppers. You can take out the veins and seeds for a milder, yet tasty burger. Kitchen Note-I like the Amazing Taste Seasonings for Burgers because they use all-natural spices & herbs and do not contain MSG or other artificial flavors. Check out the Honolulu Burger, too! This sounds so yummy! We love burgers and love to try different recipes. Hope you're having a happy memorial Day!